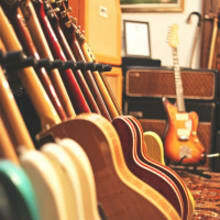 At The Music Locker we love vintage, rare and quality instruments. Whether you’re after a guitar, amp, accessories or drums you’ll find all the names and brands you’d expect – Fender, Gibson, Rickenbacker, Tokai, Marshall, Vox, Hiwatt, Watkins, Simms-Watt, Ludwig and Premier. These instruments deserve to be played and cherished into the 21st century. We want to keep that history alive and thriving. We pride ourselves on our high quality and safe worldwide shipping at an affordable price so please see the quote for your country on http://themusiclocker.co.uk/shipping/ Postage price includes boxed and secure packaging, insurance for the sale price and full tracking. UK postage is a door-to-door personal courier service, minimising all risk of damage! If you're not located within Europe, you may be eligible to pay import duty or tax, of which The Music Locker cannot be held responsible. Please make sure you are aware of this before buying. If the item you are looking at contains rosewood, buyers outside of the EU will have to wait up to an extra 15 days to the original shipping quote due to the new CITES legislation. We will need to apply for an export certificate once purchased, but The Music Locker will cover all extra costs at a gesture of goodwill. Please contact us for further information. Please Note: It is the philosophy of The Music Locker to keep all items as original as possible, only changing original components when absolutely necessary. This includes valves, capacitors, transformers, potentiometers, frets, etc. This gives the buyer the option of tailoring to their exact needs, and may mean that the item is not operating at optimum performance levels. Therefore, your personal preference may differ, depending on your circumstances (i.e. collector or musician), and you may decide to service the item in more depth upon receiving. The Music Locker cannot accept responsibility for any costs of refurbishment to a standard different to the one advertised. Please also be aware that each item is serviced to UK regulations and our customers overseas may need to make slight alterations to meet electric requirements, of which The Music Locker cannot accept responsibility for. Please make sure you are aware of this before buying. In accordance with the Consumer Contract Regulation 2013, you are entitled to a 14 day cooling off period to return the goods, providing the product is found to be in the same condition as it was when despatched. The buyer pays the return postage. If you change your mind outside of this period and the product is not in any way defective, then solely at our discretion, we will accept the product return subject to a re-stocking charge of 10% of the product sale and delivery price. The buyer pays full return postage plus the restocking fee upon satisfactory return of the item.